The Coffee Creek Quilters prison quilting program was featured this month in the Australian crafting magazine Homespun. 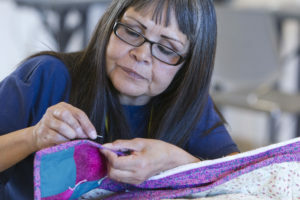 “Crafting with Conviction” shows how teaching handcrafts in jails and prisons can have a therapeutic effect. In addition to our program, two others were also featured in the article. Fine Cell Work operates in 31 prisons across England and Wales. They train men and women to do high quality, paid, creative needlework. Participants learn the skills in a group setting, then continue their projects in their cells. The Australian Soft Toy Program and Sit and Knit are for community-based offenders who aren’t incarcerated. Volunteers teach participants to make toys, quilts, scarves, hats, jumpers, and blankets in a group setting. They learn new skills while improving social connections. We invite you to read this excellent article.